In a 2007 decision, a judge on Israel's Supreme Court described Shawan Jabarin, director of the Palestinian non-governmental organization al-Haq, as a "Dr. Jekyll and Mr. Hyde," acting sometimes as the head of a human rights organization, and other times as an "operative in an organization which has no qualms regarding murder and attempted murder." The judge was referring to Jabarin's extensive history as a senior member of the Popular Front for the Liberation of Palestine, or PFLP, which Israel, Canada, the United States, and the European Union have all designated as a terrorist organization. The group is responsible for several gruesome attacks against Jews and Israelis, and has even killed Americans. Yet Jabarin now runs a prominent NGO that not only promotes the Boycott, Divestment, and Sanctions (BDS) movement against Israel and works with others that do the same, but also employs other former PFLP operatives, some in senior positions, who have served prison sentences for terrorist activity. The case of Jabarin and al-Haq is just one of more than 100 links that Israel's Ministry of Strategic Affairs found between PFLP and Hamas, the terrorist organization in control of Gaza, and NGOs that promote the BDS movement, some of which are financed by European countries and philanthropic foundations. The ministry presented its findings in a new report titled, "Terrorists in Suits: The Ties Between NGOs Promoting BDS and Terrorist Organizations." The report makes clear what fair-minded people should already know: the BDS movement is not social justice or political activism; rather, it is an attack on Jewish sovereignty, in which efforts to demonize and delegitimize replace the military campaigns of old. The end goal, however, remains the same. "The [BDS] campaign involves a network of non-governmental organizations, a number of which have close ties to designated terrorist organizations, most prominently Hamas and [PFLP]," the report states. "Terrorist organizations see the ‘civilian' struggle against Israel—demonstrations, marches, fundraising, political lobbying, and the so-called ‘peace' flotillas—as a complementary effort of their armed attacks against the state of Israel." "The terror groups have realized that armed conflict is not achieving its objective and is perceived as illegitimate by the majority of Western society," the report continues. "As a result, Hamas and PFLP operatives have infiltrated and adopted seemingly benign NGOs in the Palestinian Authority, Europe, North America, and South Africa, for the purpose of advancing their ideological goal: the elimination of the state of Israel as the nation-state of the Jewish people." These terrorist organizations view NGOs in the West as a "convenient means for raising funds, which they could not otherwise obtain." Indeed, these NGOs receive funding from aid agencies, which in turn receive funding from Western governments and private philanthropic foundations. "In our estimation," the report states, "in light of the ties between the terror organizations and these NGOs, there is concern that government and private funds are being transferred to terrorist organizations, both directly and indirectly." According to the report, NGOs that promote the BDS movement employ more than 30 current and former terror operatives in Hamas and PFLP. The report comes at a time when the BDS movement is a controversial topic in the United States. Many pro-Israel voices have decried how first-term Democratic Reps. Rashida Tlaib (Mich.) and Ilhan Omar (Minn.) publicly support the BDS movement, and how Rep. Alexandria Ocasio-Cortez (D., N.Y.) associates with an organization, the Democratic Socialists of America, that also supports it. Commentators are right to call out sitting members of Congress who do not believe in Israel's right to exist as a Jewish state—especially when those lawmakers epitomize the growing sentiments and energies of the American political left. Ultimately, however, Tlaib, Omar, and Ocasio-Cortez have little ability to influence legislation in Congress, at least right now. More worrisome is what is taking place in the Senate. "Israeli officials admit greater concern that close to half of all Democratic senators voted against the [anti-BDS] legislation proposed by Sen. Marco Rubio (R., Fla.) last week," Haaretz reported Tuesday. "Almost all of the Democratic senators who are potential 2020 presidential nominees—from Elizabeth Warren, Kamala Harris, and Bernie Sanders (an independent who caucuses with the Democrats) to Sherrod Brown, Cory Booker, and Kirsten Gillibrand—opposed the legislation, citing concerns over freedom of speech." 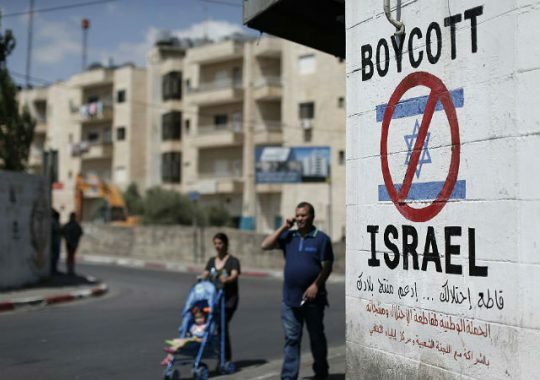 The bill would, among other measures, permit state and local governments to withhold contracts and take other actions against companies that participate in the BDS movement. As I wrote last month, supporters of BDS are "either too ignorant or too dishonest to acknowledge what the [movement] is: nothing less than a form of economic warfare against Israel meant to destroy the Jewish state." They may not seek Israel's destruction through force, but through BDS, people like Tlaib and Jabarin seek to undermine the Jewish state to the point that it ceases to endure as we have come to recognize it, with the attached implications for Israeli Jews, who live in a region in which most governments would be all too happy to witness their slaughter. These points seem lost on many Democrats and college activists. But, as the Ministry of Strategic Affairs' report makes clear, too many NGOs are well aware of what they are doing. The Israeli judge was wrong in 2007. In the case of Shawan Jabarin, and other like-minded "humanitarians," there is no Dr. Jekyll, just Mr. Hyde—and an anti-Semitic one at that. This entry was posted in National Security and tagged BDS, Hamas, Israel, Terrorism. Bookmark the permalink.